Assess student understanding of algebra, geometry, statistics, and trigonometry concepts with these math worksheets for high school students. Don't see a worksheet you need? 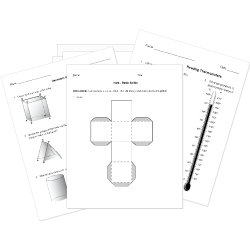 Use our Test Maker™ to create your own printable that fits your needs. Browse math questions or use our advanced search to find existing questions while filtering by grade levels and keywords. Customize your test further by creating your own assessment questions. Use these Pre-Algebra, Algebra I, and Algebra II tests to gauge student comprehension of algebra topics including: linear and quadratic equations, inequalities, functions, exponents, radicals, and logarithms. Derivation of the Equation of a ParabolaNew! Derivation of the Equation of a CircleNew! Derivation of the Equation of a HyperbolaNew! Derivation of the Equation of an EllipseNew! Understanding the Intersection of Functions new! Understanding How to Solve Simple Equations new! All Circles are Similar new! Formula for the Circumference of a Circle new! Parallelogram - Congruent Diagonals is Rectangle new! Proofs With Lines and Angles new! Proving Alternate Interior Angles are Congruent new! Triangle Congruence Through Rigid Motions new! SSS, SAS, and ASA and Rigid Transformations new! The ability to estimate, interpret, and manipulate data is an essential skill. 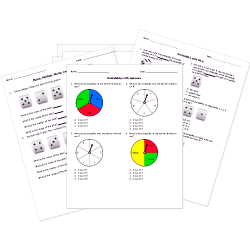 Strengthen student understanding of probability and statistics concepts with these worksheets. Explore topics such as trigonometric ratios and functions, Sine and Cosine Law, trigonometric identities, the unit circle, and radians and degrees with these worksheets. These worksheets give students a chance to practice calculus topics, including limits, differentiation, tangent lines, and integration.